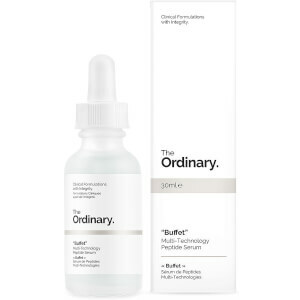 Target visible signs of ageing with the "Buffet" Multi-Technology Peptide Serum from The Ordinary. Combining an array of effective technologies, the “Buffet” serum is able to target multiple signs of ageing in one versatile formula. 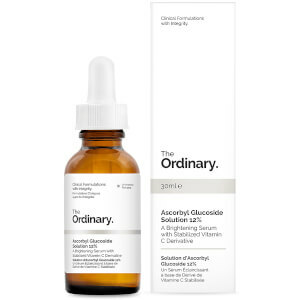 The concentrated serum boasts multiple Peptide complexes, including Matrixyl 3000, Syn-Ake and Relistase, which work in synergy with 11 skin-friendly Amino Acids. With regular use, the serum seeks to smooth the complexion, reducing the appearance of fine lines and wrinkles. Expect a youthful look that is ultra-nourished. Noticing improvement in skin, I have dry skin and it doesn’t feel to add to this either. My daughter recommended this to me, and I've only been using for a couple of weeks. But I'm seeing a healthier glow! Can't wait to see what else it can do! 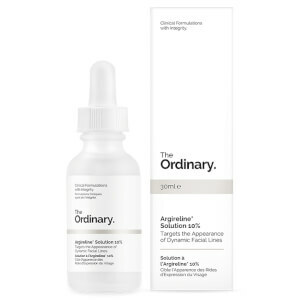 I been using this product for about a year the results are great my complexion is bright and glows since using The Buffet Ordinary Product I see results like really. I've been using this product for almost a month and my skin's texture has improved and it has a more even tone. Very satisfied with this product and I will be repurchasing! I have been following The Ordinary products and finally ordered this via Skin Store. In just a few days, my skin seems more hyrdated and plumper. Very happy with this product, and I followed the recommendation to use this with the Hylauronic serum also.